The second installation in my “back-to-school bootcamp” hones in on lunch box gear. I can’t overstate how much easier it is to pull together school lunches when you’ve got your meal packing essentials stocked, organized, and in good working order. 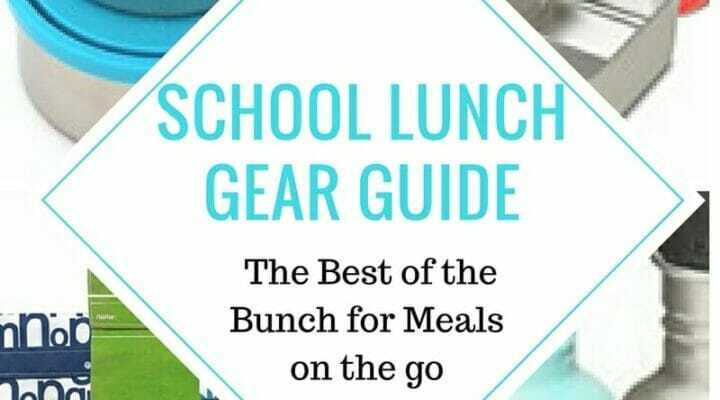 Having written an entire book devoted to the subject of school lunch, I have road tested more than my fair share of hardware. Today, I round up some of my favorites to pass along to you. Many of these items don’t come cheap, but in my experience, it pays to invest in sturdy equipment that will last for the long haul. Be sure to label everything you’ve got, so that if it turns up in the lunch room, it can find it’s way back into the hands of your child. If you’ve got favorites of your own, please share in the comments section below. Over time, I’ve gravitated towards compartmentalized containers for packing lunches. I find my kids are less likely to lose them because of their larger size. It’s also easier for me to fill a single box and for them to eat it than when I pack lots of little containers (which they then have to unpack). Planet Box — My number one choice for best overall lunch bento. A very sturdy, stainless steel container that fits into an insulated lunch box. You can throw the whole thing in the dishwasher if you like. Seemingly indestructible. One downside is that it’s not great for foods that are liquidy (I sometimes lay a piece of plastic wrap to provide a barrier). Bentgo — Though some folks prefer to stick with stainless steel, these bentos are made off heavy-duty BPA-free plastic. They’re better suited to smaller appetites since they are more petite than the Planet Box. The interior pops out so it can be easily washed. It also has a good seal, which means less problem with leaking. Lunch Bots — These are great in lieu of using several small containers for your fruits, veggies, and snacks. I’ll often fill one and then pair it with a sandwich or thermos of soup. They also pass the test for being cool enough for my older kids (where the Planet Box and Bentgo fall short). A lunch box essential to make sure kids stay hydrated throughout the school day. Fill the night before and store in the fridge so they’re nice and cold. Stainless Steel — There are a variety of stainless steel water bottles in a range of prices. The Klean Kanteen brand has proven reliable in our house and comes in a rainbow of colors. Lifefactory — My personal favorite, these glass water bottles are encased in protective silicone, which means the water tastes great. I’ve never had a problem with breakage, but it’s something to consider for littler ones who might be a little clumsier with their lunch gear. A good thermos means it’s easy to make use of leftovers. Plus, some kids really gravitate towards a warm meal for lunch versus a sandwich or salad. I’ve had the best luck with old-school brands. You may find a need for additional containers, particularly if you don’t go the Bento route. Kids Konserve — These stainless steel containers come in a variety of sizes with colorful lids that form a tight seal. I’ve had mine for several years and they hold up as well today as they did when I bought them. Lunch Skins –– These re-usable bags come in loads of super charming prints for packing sandwiches. Wax Paper Bags — I always keep a box of these handy. They’re compostable and are good for sandwiches and snacks. There’s also something sort of old-fashioned about them, which appeals to me. Dressing 2 Go –– If you have salad eaters in your house, small containers that reliably won’t leak are a good item to have on hand. We’ve had good luck with these Dressing 2 Go containers. Cloth napkins to manage lunch box messes. You can find adorable options for purchase, or peruse your linen closet for ones that are past their prime. Lastly, I would be remiss in talking about lunch packing essentials without mentioning this! You can find links to buy a copy by heading here. They making packing meals so much easier, Dixya…for kids and adults.